Siquijor has long sparked my fascination for the supernatural. With its folk healing festivals, odd inn names, and potions sold as souvenirs, curious tourists (like me and Neil) couldn’t help but see what it’s like. So this year’s Holy Week break, we decided it was time we visit Siquijor, an island slightly bigger than Camiguin, our hometown. By air: From Cebu, you can opt to fly to Dumaguete via Cebu Pacific then sail to Siquijor. But this is an expensive option especially if you’re booking your Holy Week trip at the last minute. 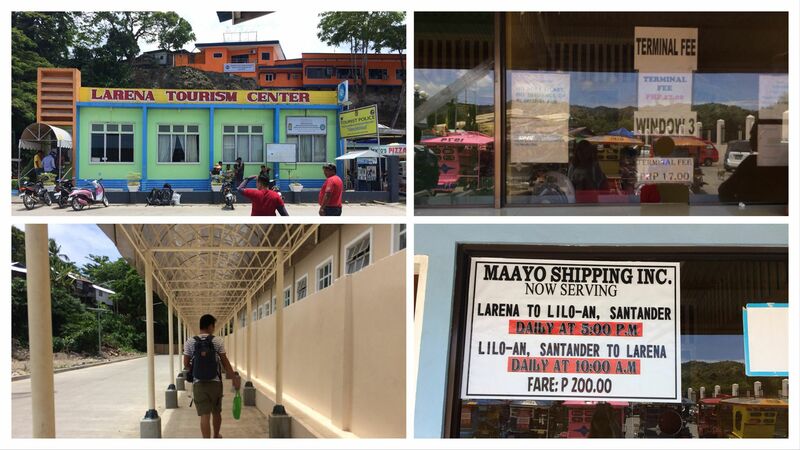 By land and sea: Take a Ceres bus from Cebu City South Bus Terminal to Santander Liloan and then board a ferry from Liloan Port to Larena (Siquijor) via Maayo Shipping. By sea: Don’t like long bus rides? Choose OceanJet (Cebu – Tagbiliran – Larena route). Hop on a ferry from Cebu Pier 1 to Tagbilaran and then to Larena. 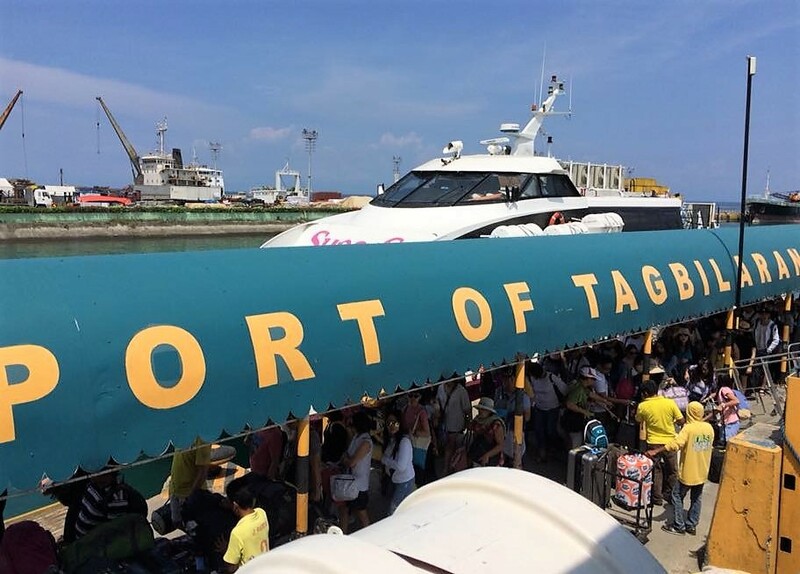 Although this route has a stopover in Bohol, you don’t have to get off at Tagbilaran port. During the stop at Tagbilaran, one of the crew members will simply hand out your ticket with a seat assignment for the trip bound for Larena, Siquijor. We wanted to get to Larena quickly so we chose the last option. The ferry trip from Cebu to Larena lasts for about 4.5 hours. That’s like savoring four to five chapters of a book you love. Before visiting Siquijor, this was the trickiest question for me. In our experience, staying as close as possible to the port was a great idea. We don’t like to take chances, arrive late at the port and miss our boat on our way back to Cebu. But little did I know that Larena is no longer the center of Siquijor. It’s been replaced by “Siquijor” as the town proper. Now, the center of action, at least for tourists and tourist-oriented businesses, is in San Juan. This is where most visitors stay. 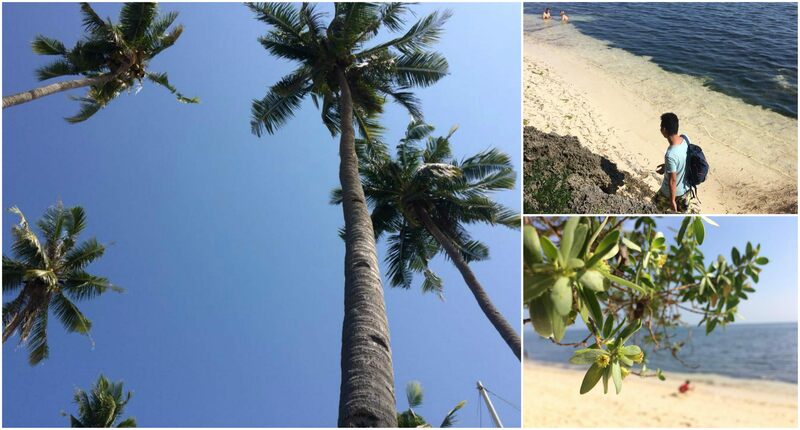 It makes perfect sense as properties such as Coco Grove Beach Resort, Island Rendevoo, and Salamangka Beach and Dive Resort are only minutes away from the white sand beach of Siquijor. But if you’re booking last minute (like us), you might find very few affordable options in San Juan and end up staying in Larena instead. While most tourist spots won’t be more than an hour away from the Old Town (Larena), majority of inns, B&Bs, and hostels in the old town don’t include meals in their offers. This is a big deal, especially when you’re traveling during the lenten season because most eateries, cafes and restaurants are closed. If you decide to stay in Larena, there are inns that allow you to cook your own meals. These properties are ideally situated near public markets and grocery stores. Be sure to ask the hosts about amenities before booking. Our room in Townview Guesthouse (P1,039.29 /night ) was misleadingly named “deluxe” yet it was a fan room with a broken CR doorknob and a flat screen TV with blotches, streaks, and scratches. These are just among a few downsides to booking late. So be sure to reserve a room well in advance to get better options at reasonable prices. 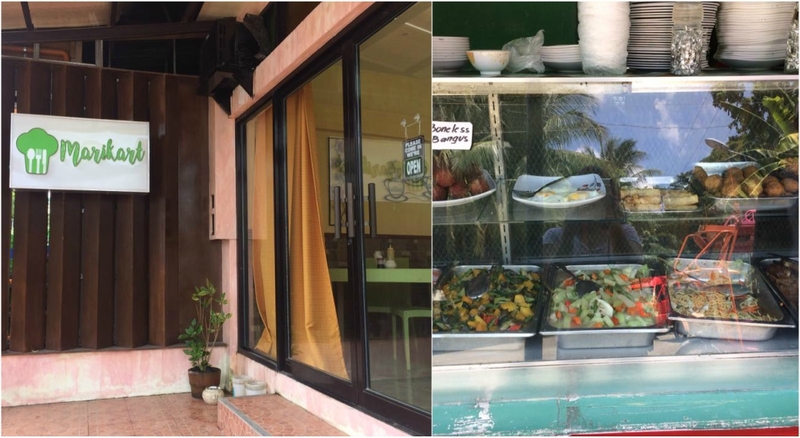 Food in Siquijor, at least in Larena, was a bit of a letdown. Sometimes they get it right. Sometimes, they don’t. Yet meals and snacks were shockingly cheap. I remember asking sales clerks “how much” a couple of times just to make sure I heard them right. I got used to the sky high prices of meals and everything else in Cebu. To give you an idea, here’s a breakdown of some meals we had. P18 for four mini cup cakes and hot water (we provided our coffee – Basilio from Rustan’s); P70 for two orders of fried chicken, a piece of grilled chicken wing, two cups of rice, and a plate of fried noodles; P330 for two orders of chop suey, a piece of fried chickens leg, a serving of humba (pork in soy sauce), chicken soup with thigh, a serving of stir fried noodle, chicken adobo, and four and a half servings of rice. I was stunned. If you’re in Larena, there are two dining spots that might be near you: Marikart and Larena Triad Coffee and Restaurant. Upon your tour, your tricycle driver/tour guide can show you where you can eat good food at cheap prices. If you’re planning to visit the town during holy week, expect most stores to be closed on Good Friday. They are normally back to business on Black Saturday. Ask your guesthouse or inn receptionist or manager to recommend a tour guide or driver. You can opt for a motorbike tour or a tricycle tour. We opted for the latter, which cost us P1500 for a full-day tour of the island. You can further split the cost if there are three or four people in your group. Motorbikers have no extra helmet for passengers. Tricycles have roofs to cover our heads from heat and debris that might fall along the road. We thought it was safer, too. So, for us, the best way to explore the island is on three wheels. On our first day in Siquijor, Neil was itching to jump off a cliff at Salagdoong Beach so we had to rent a tricycle for a drop-off and pick-up at the resort. This cost us P500. It was a bit pricey but the place was about 30 minutes from the town proper. 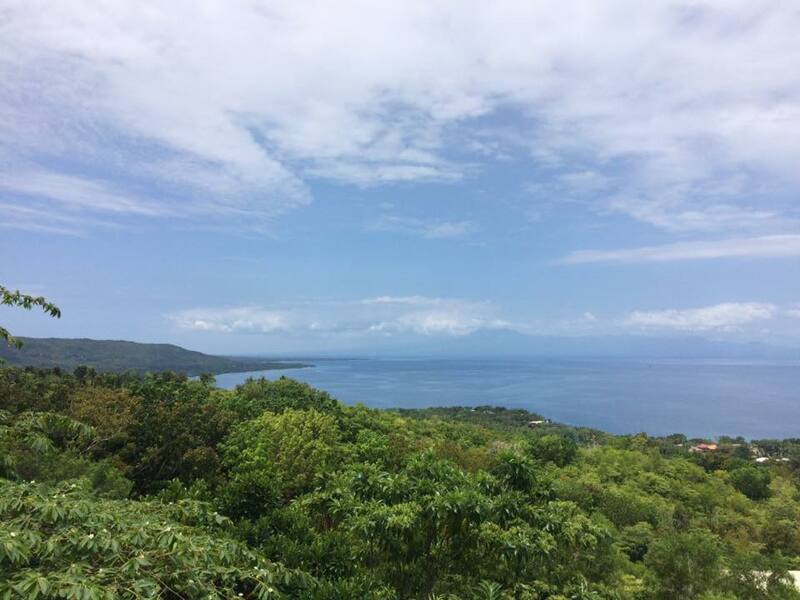 But what if you want to get a cup of brewed coffee while soaking in a panoramic view of Siquijor? 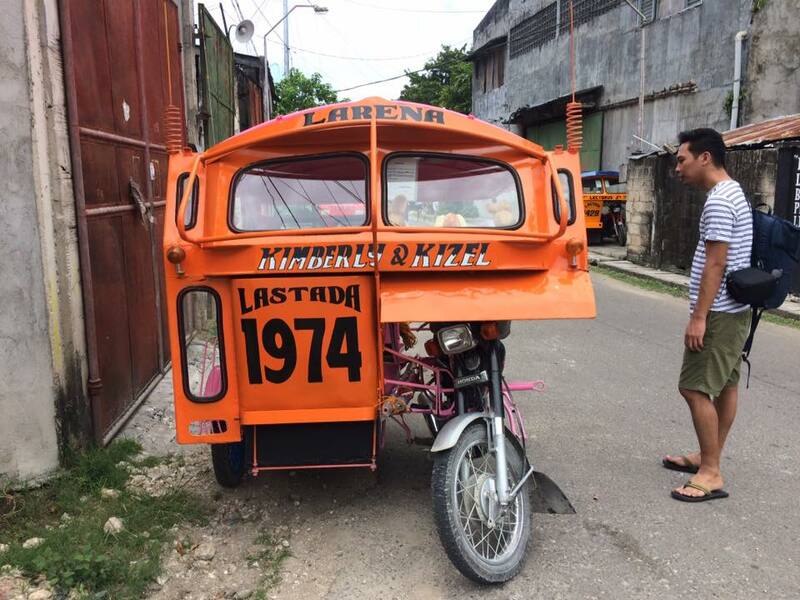 Ride a motorbike (tricycles can’t tackle steep roads) to Larena Triad from the town center or port. It only costs 40 pesos per way. Getting a ride from Larena was easy yet I can’t say the same is true in other areas. If you love surprises, you won’t be here reading this. So I guess you want a bit of predictability. Let me help you. 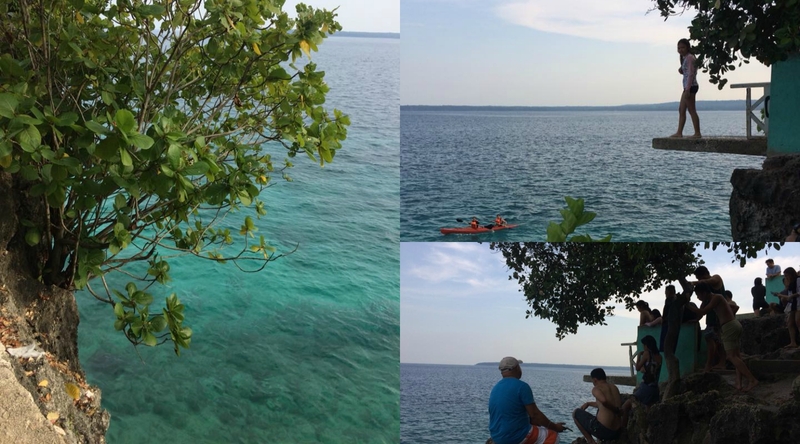 Before visiting Siquijor, I thought of the province as a lonely and curious place so I was utterly surprised by the thrills and adventures we discovered! Newbies to cliff jumping and waterfall diving? My advice is to take it slow and build your courage one step at a time. Cambugahay Falls offers fun activities like swinging on a tree vine/branch before jumping to the cool pool of water. You can also dive directly into the 7 to 8 feet deep pool of water on the third tier. These baby steps might or might not prepare you for the terrifying jump off the cliff at Salagdoong Beach and Resort. I believe that by building your confidence jumping off not-too-high cliffs will help you muster up the courage to attempt a 20-and-35-feet high jump next. Neil followed a different sequence. Jumping off from the 35-feet-high diving platform at Salagdoong Beach Resort before cliff diving and branch swinging in Cambugahay Falls. He winged it. Maybe you could, too. I did try waterfall jumping in Cambugahay Falls, motivated by the sheer fun of it. But looking at the cliff jumping platforms and the divers at Salagdoong Beach only inspired terror in me. Gladly, taking a rain check is an option. Potions, souvenirs, and fish massages are available here. 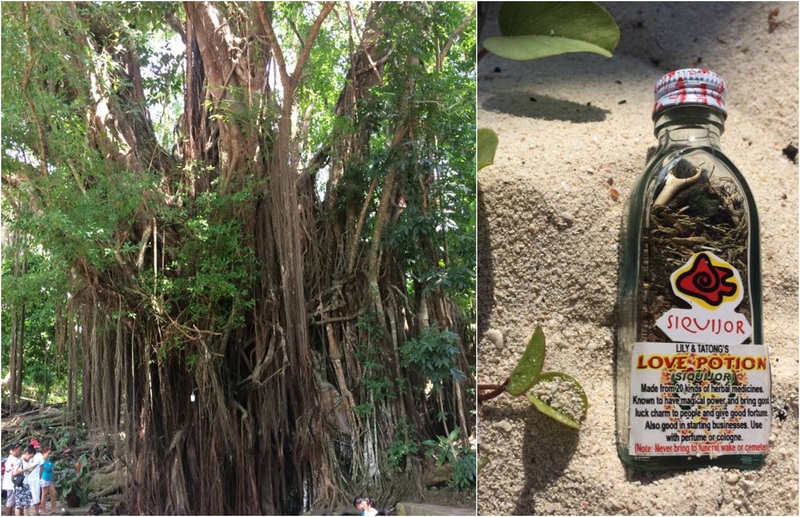 The 400-plus year old tall Balete tree was a backdrop to the fish massage area. Entrance here is P10 per person. If you want the love potion, you have to prepare P200. 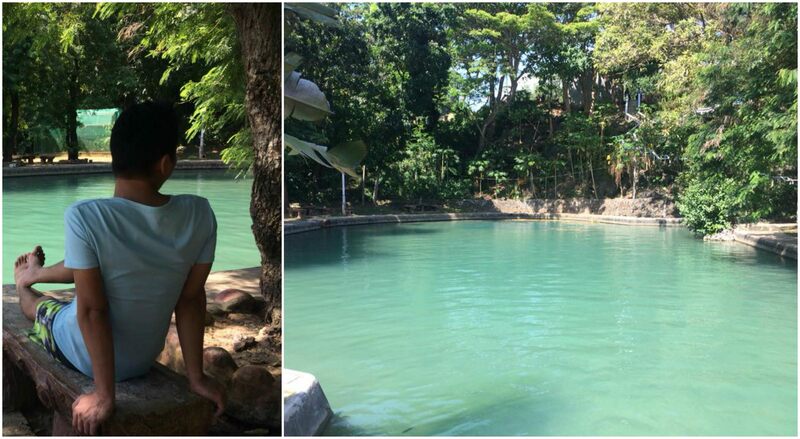 Locals and tourists can swim here for free. There is a restaurant within the area but it was closed on Good Friday. We didn’t go for a swim yet it’s a great spot to watch the locals enjoy a day out with their families and friends. I read online that this was the best spot in Siquijor. 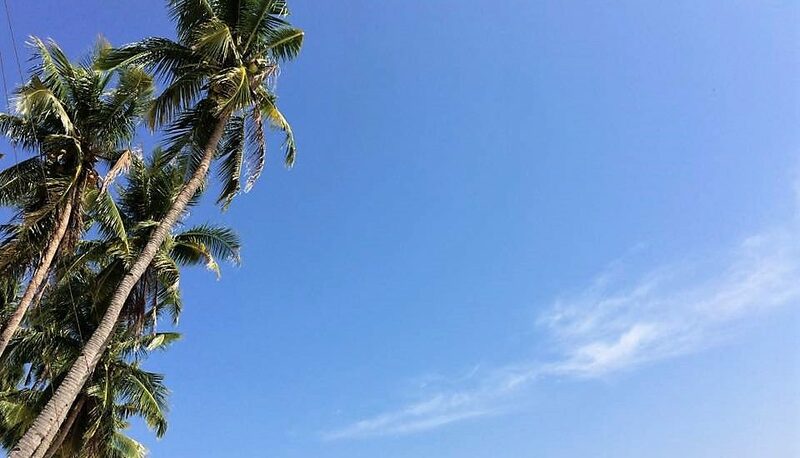 Sure the long stretch of whitesand beach with sprawling coconut trees was charming. If you’re planning to swim in the sea, that’s a different story. You need to battle with seaweeds for space. We saw this dome-like structure while we were having breakfast at Marikart in Larena. Neil searched for more pictures of it online and found that it was a cafe and restaurant overlooking the island province. So we decided to visit it. After about 10-15 minutes of motorbike ride, we reached the top, ordered two cups of Americano, and took pictures of the panoramic view. 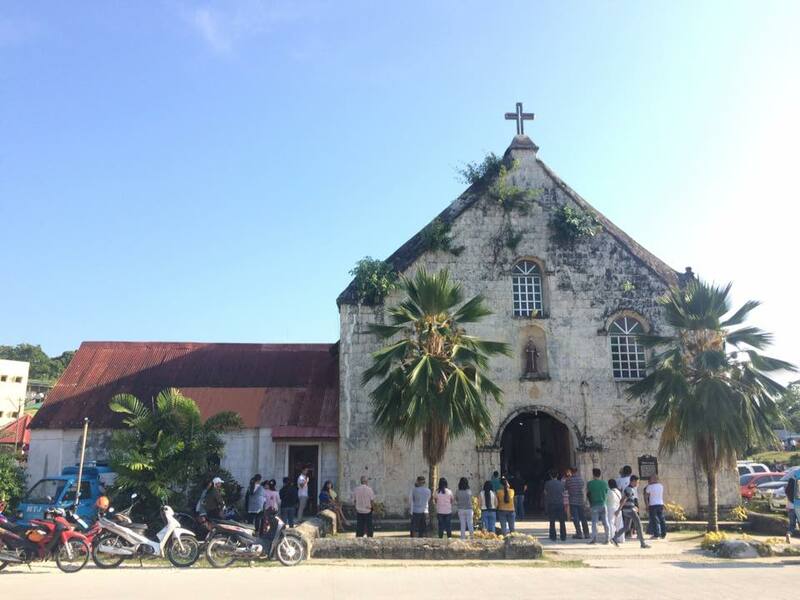 After the must-have “I Love Siquijor” shot, we stopped by this church, which was bustling with locals (and maybe non-locals) attending the Good Friday mass. After Neil took three pictures of the structure, my phone camera died. What a great way to cap off a tour around Siquijor. Have you been to Siquijor? If not, I hope this helps you plan your trip. Also, what’s stopping you? Hahaha.. Swerte daw sa business ang love potion, Jool! Thanks for dropping by! Nice to read a complete guide of Siquijor, never been into this place because of the aswang stories when I was small haha. The falls and beach make me reconsider it now.